Novus Content and Footage Films have released the official trailer for "'TIL DEATH DO US PART" starring Taye Diggs, Annie Ilonzeh and Stephen Bishop. 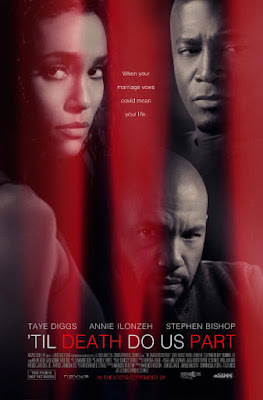 "'TIL DEATH DO US PART" is a suspenseful thriller about a young woman's struggle to escape a violent marriage. The film is set to arrive in theaters on Sept. 29. Michael & Madison Roland, had planned to spend the rest of their lives together, until one day Michael's controlling ways turned their perfect marriage, into an abusive rollercoaster no woman could survive. With the help of her best friend, Madison decides to get away. After adopting a new identity, she meets Alex Stone and learns to love again. All is well, until Michael discovers Madison's whereabouts, and recreates the nightmare she once lived all over again.